In 11/22/63 by Stephen King Jake Epping, a high school English teacher in Lisbon Falls, Maine, is recruited by his dying friend, Al Templeton, to travel through a time portal located in the storeroom of Al's diner. When he goes through the portal, it will be September 9,1958. Al wants Jake to complete a task he was unable to do: prevent Kennedy's assassination. There are two known facts about the time portal, according to Al. First, when you return from the past, no matter how long you've been there, only two minutes have past in the present. Second, each time you go back everything you've done before is erased so it's all back to how it was originally. Jake decides to honor Al's request and change history. He travels back in time, calling himself George Amberson. Jake has motives of his own for going back in time. He'd like to prevent a horrific act of violence that occurred on October 31,1958, in Derry. Although it appears to be possible, obviously any effects from changing history are unknown. And it seems that the past pushes back - it doesn't want to be changed. 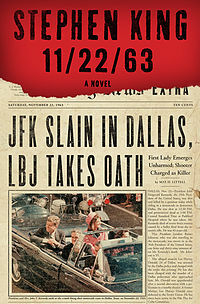 11/22/63 is not what many people would consider a typical Stephen King book. There aren't an abundance of supernatural events. Fans of Kings work are going to recognize many references to some of his previous books, especially those set in Derry. And, although 11/22/63 is a time travel novel, it's really much more than that. What about the Butterfly Effect? Can history be changed? What will altering a major event set into motion? Will love complicate Jake's mission and change events? Clearly King has done his research. He masterfully set the time and place, which is clearly evident with all the little period details he includes throughout the story. All the details of Oswald's life are also interwoven into the story. He combines all these real life details into the plot, which is populated with wonderfully developed fully realized characters. The narrative seems very plausible because the people and the setting seem so real. This is an excellent book by a highly skilled author. Had I finished it a few days earlier it would have certainly made my top list of 2011. 11/22/63 is very highly recommended. I could imagine. I’d had at least some preparation, poor though it had been. And really, was there any adequate way to prepare a person for a trip back in time? “Every time is the first time.” I said it slowly, putting a space around each word. Trying to get them to make sense in my mind. I just read this! I finished it last week. I'm not a horror book reader at all...& almost missed this book because of the author. *chuckles* I'm so glad I picked it up & read the inside cover. :) What a page turner! No horror, only science fiction. I got a little confused about the yellow card man (orange, black, green...), but it was ok. Getting confused on that didn't ruin it for me. The story was great. It was really good, wasn't it? Basically, the changing cards just signified that a change did happen with each trip.